Today I am returning to the topic of graffiti hunting in Ireland's city centre. Dublin is a surprisingly good place to look for graffiti and street art. It is a small city and there seems to be much less visible graffiti than many other European cities, but this just adds a sense of challenge and an element of fun to the search! I emailed a photo of a graffiti filled street to Faran from the Tag! 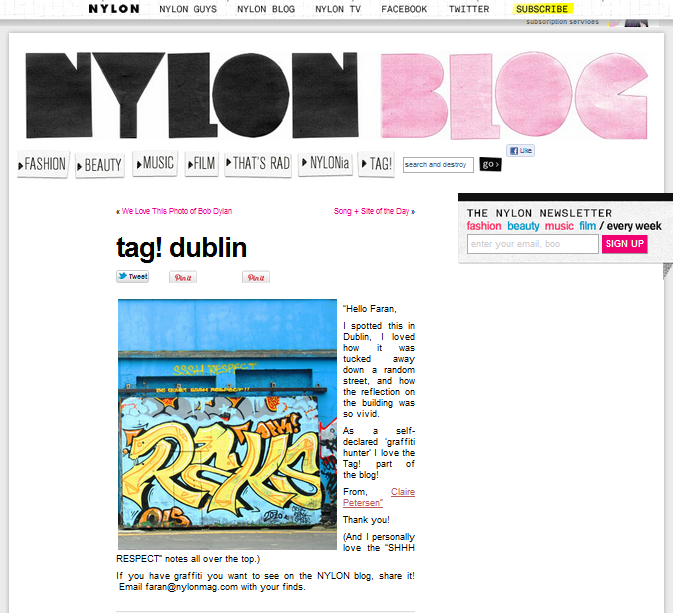 section of the Nylon blog, and next thing I know, my photos featured on the blog! Handy enough! As you may know, I started graffiti spotting because of my involvement with Scene Not Herd, a cultural youth group in Dublin. There should be an exhibition to do with gureilla art coming up soon in the No Grants Gallery. Shall keep you posted as always!